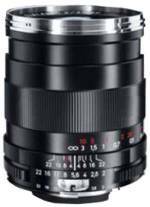 This short telephoto is a classic portrait focal length which is further enhanced by the long barrel rotation for precise control of the focus point in the image. The Planar T* 1,4/85 is optimized for medium to longer distances and provides distortion-free performance, which only improves as the lens is stopped down. The fast f/1.4 aperture is very useful for creatively controlling the depth of fi eld and the nearly circular diaphragm creates a pleasing ‘bokeh’ in the out-of-focus areas. The Planar T* 1,4/85 is available with the F bayonet (ZF), EF bayonet (ZE) and K bayonet (ZK) lens mounts and is designed for use with full-frame SLR and DSLR cameras. Combined with a DSLR with a 1.5 crop factor, the lens becomes a focal length of 128 mm.